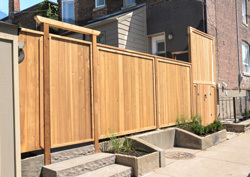 If your fence or deck is starting to look old, you may not need to replace it! The NoCo Lawn Care team may be able to restore the beauty of your fence or your deck for a fraction of the cost of replacement. Our deck and fence refurbishment specialists can discuss with you the options available to make your deck or fence look like new again, going over the cost effective methods we’ve used on many other decks and fences in the Nothern Colorado area. In most cases, our team is able to restore the original beauty of a deck or fence that is completely gray and weathered for less than half the cost of replacement! We use the safe, effective power of water to make your fences and decking look new again. Using a pressure washer, we use powerful jets of water to blast away years of dirt and grimes, revealing the clean surface underneath. 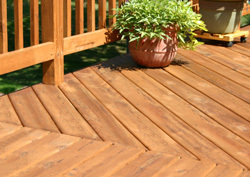 Then our team will carefully restain the deck or fence, making it look like new again. You’ll be amazed at how effective our methods are and how quickly we’ll be able to restore your wooden fence or decking to its original beauty. We can stain your new fence or deck, as well! You can reach us at 970-308-8402 or by contacting us through our website. We’ll give you a free estimate on the work that you need to have done on your fence or deck in the Nothern Colorado area.